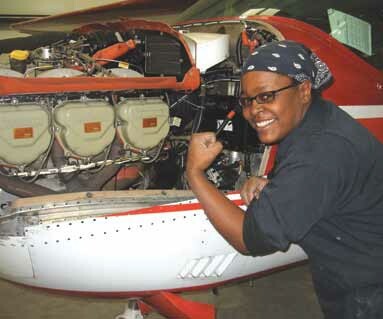 Rivets - The Little Bit that Could | Tennessee Aircraft Services, Inc.
Few pilots and most mechanics don’t often give the little rivet much thought. The engine quits and you glide to the ground with a substantial amount of control. The electrical generating system fails and you revert to the built in backup system, the battery. The vacuum gyros are backed up by electric turn coordinator. Most of us have some kind of portable battery powered navigation system and even communication hand held for redundancy as well. The only backup for rivet failure is thousands of other rivets. Some commercial airliners have as many as a million rivets. We think in terms of thousands on our Cessna’s but every one is in a particular place for a particular reason. Rivet details are kind of boring for most folks so I won’t drag you through too much. Rivets come in many different shapes and materials for different applications. The most common AD rivet is made with 2117 aluminum in either a universal head or the flush head. The preformed end I call the head and the shop formed end is called the shop head or the tail. The universal head is the one that makes those little bumps all over your plane and are sometimes incorrectly called button head rivets. The flush head is just as it sounds, flush. Rivet diameters are measured in 32nds of an inch. A #3 rivet is 3/32”, a #4 is 4/32”, and so on. The lengths are measured in 1/16th with some in between lengths. A rivet with p/n AN426AD4-5 would have a flush head (426), use 2117 aluminum (AD), be 1/8” in diameter (4), and 5/16” long (-5). The good, the bad, and the ugly. Several ways to get it wrong and one way to get it right. You’ve seen the old films or news reels of big steel building construction with the workers putting red hot steel rivets into the structure and driving them with huge pneumatic hammers. Setting aluminum rivets looks a little like that except standard AD rivets are set at room temperature using relatively small pneumatic rivet guns about the size of a heavy pistol. Setting a rivet is basically holding it in place from the head side and smashing, with precision, the shop end. You would know there are rules to properly set a rivet. An unset rivet tail should protrude 1 ½ times its diameter through the parts. After setting, it should be 1 ½ times wider than its original diameter and only protrude ½ the amount of its original diameter. So, a typical #4 rivet will protrude 3/16” before setting. After setting, the tail will be 3/16” in diameter and only 1/16” tall. Rules are meant to be broken and different situations call for variations. Layers of materials whose thickness approach or exceed the diameter of the rivet force slight changes in these rules and techniques. The simplest method to set a rivet involves no machines at all, just a hammer and bar of metal. To demonstrate the method; a rivet inserted in a part and held in place with a heavy piece of steel or a purpose designed rivet set. Then a hammer strikes the tail of the rivet until it swells the rivet to fit the hole and creates a “shop head.” There are situations where a simple hammer and bar still fit the need. Sometimes an old fashioned application of a hammer is just the ticket. A handful of a bucking bar collection. The ones to the right of the long red handle are tungsten. 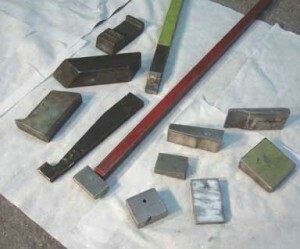 Some bars are cut and polished for one specific application. A rivet gun and bucking bar works the very same way, but backwards. The hammer is in the rivet gun and strikes the rivet head via the set. 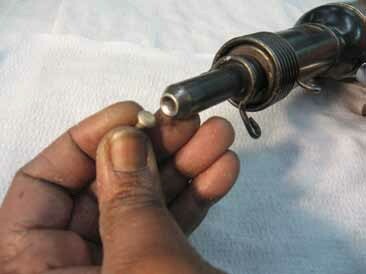 A rivet “set” is installed in the gun with an end that approximates the shape of the head of the rivet. When the trigger is pulled, a steel piston oscillates in the barrel of the rivet gun pounding on the set . 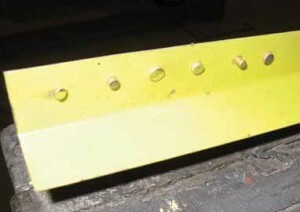 A bucking bar is held against the tail of the rivet while the gun hammers away at the head causing the tail to “set.”. The rivet swells in the hole of the aluminum parts being held together until it has taken all the space available. The exposed tail of the rivet then swells to form the shop head holding the rivet in place. The results are the same whether the impact occurs on the head or tail of the rivet. A portion of our rivet gun set collection. A universal head rivet showing the corresponding shaped set. Another common rivet setting tool is the squeezer. The same pressure is brought to bear to create the shop tail but is done with a pressing process. There are hand squeezers, pneumatic squeezers, and hydraulic squeezer but all perform the same function. One real advantage is the control over the rivet shape. 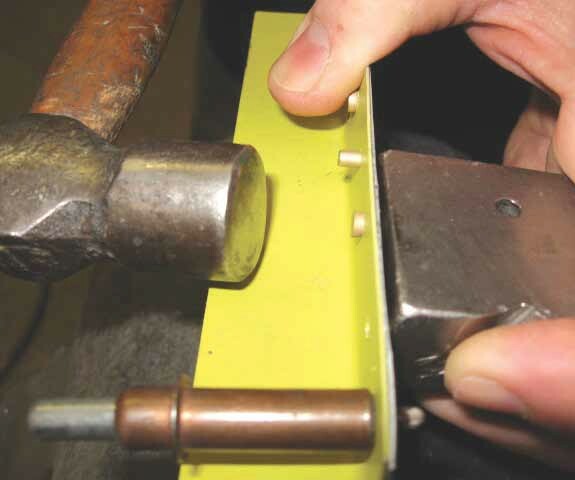 For repetitive applications of identical material thickness and rivet size, the squeeze is hard to beat. There are lots of ways to incorrectly set a rivet, and I’ve done them all. The reasons for the preset rivet exposure and the final shape of the shop tail is to ensure proper final fit and hardness. The rivet must fully expand inside the hole to form a tight permanent fit. It also must be worked enough to properly work harden the aluminum of the rivet. The work hardening is critical to achieve full strength. Setting rivets in newly drilled holes, as is the case with new construction, is very different than setting rivets in holes that have been occupied by another rivet for 30 years. Just setting a rivet enlarges the hole diameter slightly and 30 years of shear load cycles adds even more. Even when done correctly, removing rivets will do some amount of damage to the rivets hole. When improperly removed, the hole may be dramatically enlarged or elongated. 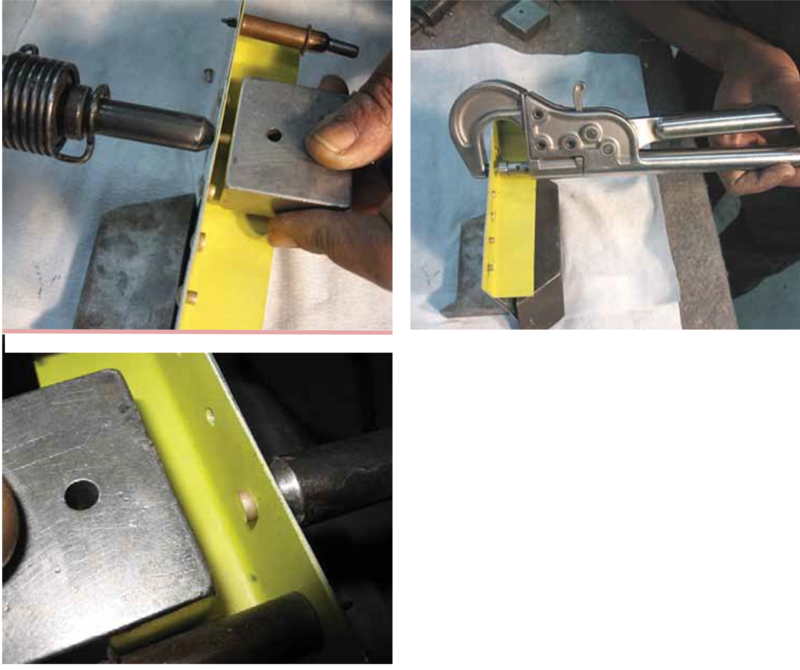 Non standard holes create problem tenancies with the set end of the rivet requiring an experienced hand on the bucking bar. Rivets are considered permanent fasteners. Some consider Cherimax rivets temporary. 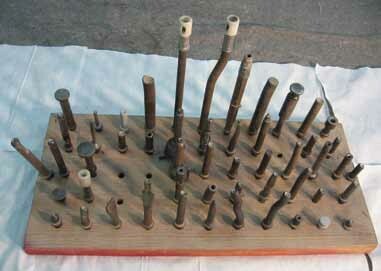 Screws and bolts are certainly used in construction where disassembly may be expected on some routine basis. I don’t consider rivets permanent but I’m a sheet metal guy and take removing rivets as a challenge. Everyone has their personal technique for removing rivets Some start by using a centering punch to create a starting point for the drill. Next, the rivet is drilled with an undersized bit to ensure staying within the rivet material. Then a full size bit drills just deep enough to remove the head of the rivet. Finally, a full size straight punch drives out the “tail” of the rivet. That’s all fine, but way too time consuming for me. The typical AD rivet already has a dimple in the center of the head to signify its design, so no need for the center punch. If an undersized drill properly finds the rivet center, so would a full size bit. A drill through the rivet just to the level of the first structure is sufficient to remove the head. Cap the head with a sharp wood chisel being careful not to mark the skin. Rivet extraction then usually only requires slight strike with a punch and the remaining tail comes out. When drilling a small skin with a thousand or so rivets, time is a major consideration. I usually drill all the heads in one pass, cap them with a chisel in a second pass, the punch the centers on a third pass. Some will require extra effort to keep the punch from bending rib flange. There are always a few that don’t cooperate and may require drilling all the way through. This presents the highest risk for damaging the hole. I’ve trained many people to remove rivets. I find the most difficult skill for a student to master is holding the drill straight and maintaining centered on the rivet. Center punch or dimple, drill bits will “walk” but just a slight lean or lateral pressure will correct it. If the bit must go all the way through, it absolutely must be straight. It sounds relatively simple, but untold number of rivet holes have been elongated or even doubled due to sloppy drill skills. Rivets hold all sorts of parts together but are intended primarily as shear load fasteners. During the setting process the rivet swells inside the hole forming to the exact shape of that hole. Installing a bolt or structural screw may offer higher shear strength but will not fill the hole like a rivet. A bolt or screw with a nut can compress the parts together creating friction which will limit part deflection, but a fastener that custom fits each individual hole is matchless. Obviously, seeing larger rivets in a particular area on your Cessna is an indication of higher stress. The giant rivets in the wing lift struts are a good example. Higher structural stress areas can also be identified by shorter distances between rivets. Typical rivet spacing, or pitch, might be 1 1/2” to 2”. Higher stress applications could have spacing as tight as 3/4” on a production airplane. Compare the size and spacing of the rivets on the top outboard aft wing skins with those surrounding the main landing gear mounts. Rivet spacing on repairs is a different matter. A repair typically requires a certain number of rivets per inch of material overlap. These rivets may be packed very tightly to keep the repair small or spread out in multiple rows if space is not a concern. Generally, the shortest pitch permitted would be 3 times the diameter of the rivet. Thus an AN470AD4 rivet with 1/8” diameter has a minimum distance from the center of one rivet to the center of the next of 3/8”. A requirement for 5 rivets per inch would call for at least 2 rows. to work here for a real education. We’ll never be the same. There are countless details about riveting that must be experienced to understand. Things like how much air pressure to use and knowing when it’s right by the sound of the gun, slightly manipulating the bar during the 2 or 3 seconds of working to form a better looking tail, or gently drawing the parts tighter by tapping the rivet while the bucking bar is held beside the tail. Each rivet is a job in itself, with its own challenges and required skill level. You may have no interest in how all those thousands of little rivets got into your Cessna. I think it’s pretty fascinating the vast majority were manually installed by the cooperation of two real human beings with skills that required effort to learn. Even after 30, 40, and 50 years, they are still holding your airplane together. I don’t recall a single aircraft accident that has been attributed to rivet failure.